Who said that hat hair days had to be bad hair days?! In the wintertime, I’m all about hats! I LOVE a cute newsboy cap or even a fluffy beanie. 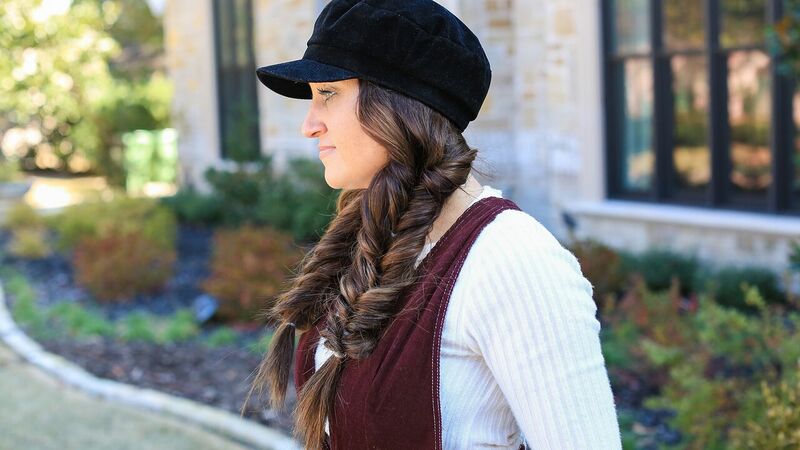 The #CGHFauxFishtail is a cute and easy hairstyle that’s perfect for the winter (but it can also be worn all year around). Whenever I wear this look, I always get so many questions on how I did it, so today I’m going to show you. Items Needed: Brush, rat-tail comb, 10-12 clear or black hair elastics, hairspray, and hat. Divide the hair into 2 even sections. On the first section, grab 2 outside pieces of hair and pull them to the front! Secure with an elastic. TIP: Place the first elastic halfway down your hair about chin level. Take the hair in the elastic, and flip it inside out over the elastic. Bring 2 more pieces from the outside to the front and secure with an elastic. Flip the hair inside out the elastic. Repeat steps 4 and 5 all the way down the hair. Secure the ends with an elastic. Tweak and fluff. I love to pancake the hair to give it a more boho feel. Add a cute hat or accessory to take it to the next level.